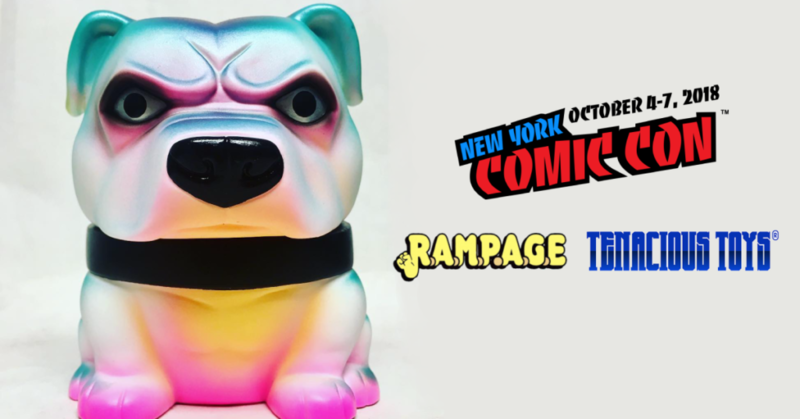 Rampaging straight to NYCC this week with Tenacious Toys is Rampage Toys with a whole bunch of wholesomeness that we’d like to share with you today. Starting off with this custom painted Tenacious Toys Danger Dog figure. We have loved the TT Danger Dog so much that we included it in our TTC Five Year Tee/Print design (read HERE). Now Rampage Toys has given it the custom paint job in this pearlescent tones that give the dog a new dimension. Available in a run of 10, standing at 5inches tall and each priced at $75 (£58). Next up we have a number of custom painted sofubi figures that Rampage Toys has worked on for this NYCC weekender. Check them out below. Anything left over following New York Comic Con will likely go on sale tenacioustoys.com in the near future! Whilst we are not at NYCC this year (saving our $$$ for DesignerCon), we very much miss being near the Tenacious Toys booth. NYCC can be a very crazy place to exist in for a few days, but the Tenacious Toys booth is like a nirvana of awesome artists and every cooler art. Oh, and Benny too! Crazy mofo. We <3 you, Benny. Hope you guys have a great NYCC weekend!